Metrolink has just release this info … more good news for CicLAvia riders. LOS ANGELES – Metrolink will employ all 17 of its Bike Cars in time for CicLAvia on Sunday, April 21 to accommodate the demand for public transportation options to and from Downtown Los Angeles for the region’s largest open streets event. More than 1,000 cyclists took Metrolink to the previous CicLAvia in October and a similar turnout is expected Sunday. Metrolink will add multiple Bike Cars on its San Bernardino, Orange and Antelope Valley Lines to transport as many cyclists as possible. With Metrolink’s convenient $10 Weekend Pass, people can ride the entire system an unlimited number of times between 7 p.m. Friday through Sunday night. Metrolink’s Bike Cars are designed to hold 18 bicycles each and space will be limited to a first-come, first-serve basis. All other Metrolink coach cars are designed to hold three bicycles each. Metrolink is modifying its regular Bike Car schedule, moving the special cars to different train sets. This means that regular trains that are scheduled to have a Bike Car may not for up to two weeks following CicLAvia. Metrolink will try to keep Bike Cars on trains with a high number of cyclists on a regular basis. CicLAvia’s route will connect the city’s historic center at El Pueblo de Los Angeles in downtown and the bustling boardwalk of Venice Beach by way of Venice Boulevard, creating an unprecedented 15 miles of car-free space for strolling, biking, playing, and experiencing the city from a new perspective. There will be activities along the route and shop owners and restaurants will open their doors to CicLAvia participants. The event runs from 10 a.m. to 3 p.m.
For details on riding Metrolink to CicLAvia and all train schedules, please visit www.metrolinktrains.com/ciclavia. For more information on CicLAvia, please visit www.ciclavia.org. Unfortunately, Metrolink has no plans to run trains on the Ventura County Line this weekend. Why not? Ciclavia is a Los Angeles City event. The majority of Ciclavia funding is provided by LA City tax payers. Valley residents contribute nearly half of City revenues. You can get to Ciclavia from Oceanside, Orange County, San Berdo, Claremont and Riverside with a $10 Metrolink Weekend Pass, yet if you are in Van Nuys, Northridge, Chatsworth or other parts of the Valley, it’s $30 for a single round trip on Amtrak, with no Bike Cars. For a family of 4 with one 5 year old, that’s $90 (kids above 2 years are half off) for LA City residents of the Valley (as well as Oxnard and the rest of Ventura County) on Amtrak, but $30 for everyone the rest of the system (5 years olds are free), plus you can use your pass on Friday and Saturday too. Please don’t tell me it’s Amtrak, because Amtrak is on the Metrolink Orange County line too. 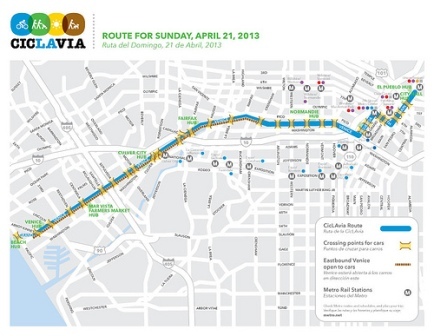 And the Metro Orange Line to Red Line option, with only three bikes on each bus, is also not possible for Ciclavia. Unlike typical bike riding in LA, Ciclavia is for everyone, including families, but Metrolink is making it prohibitive for 40% of the City of Los Angeles, as well as Oxnard and the entire County of Ventura by not having weekend service on the Ventura Line. Metrolink needs to make some changes if it thinks the next version of Prop J/R should get some votes in the Valley. I’ll pass your message along to Metrolink, and I encourage you to bring this up with them too. My best guess is that there’s no service on the Ventura County Line because there normally isn’t weekend service on that line. I’m not sure what the protocol is to get special Metrolink service, but I can ask around on Monday and see if I can get a better answer.